Love the Fulcrum Zeros spin smooth like butter, these wheel spins faster you pedal especially on the downhill . PRed the climbs without much effort. Worth every penny thanks Westernbikeworks! For a great deal. I have a Cannondale Synapse and ride 50 - 60 miles per week in Arkansas. I'm very happy with my upgrade from Mavic Aksium's that came with the bike. These wheels are light and sturdy and ride smooth. Often, when riding with friends in a line, I find myself drifting into the next guy without much effort - especially going up hills. Can't say enough good things. Western Bike Works matched a price at a different website. Shipping was quick and easy. Very happy with my purchase. I am a 200 pound roadie and bought these after breaking a spoke in my Easton wheels 20 miles outside of town. They are extremely well made, quite solid under me and have remained true for the last 300 miles. Not fantastic light, but quite smooth and seem very fast. I don't need help going down hills, but I seem to roll out off the hills further out in front of my buddies than I used to... ?spoke count, bladed spokes or the ceramic bearings. I do love the way they feel under me and am happy with the purchase. Came with Swiss stop pads. No complaints. Light wheels make a big difference when climbing and these are some of the lightest. But what about your reward for all that climbing? The high speed descent... These wheels are stable and quiet at high speed and they have a huge braking surface. 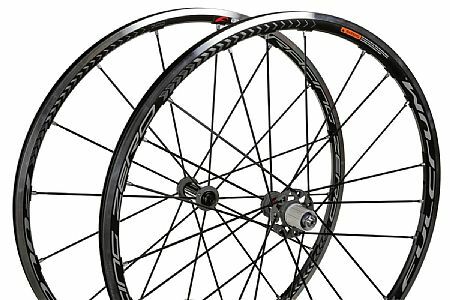 I have used these wheels for RAMROD, High Pass Challenge, Copper Triangle, Triple Bypass and several trips up to Timberline Lodge (your basic epic mountain rides) and these wheels quickly transfer power on the way up and on the way down. And when I have hit the inevitable mountain road pot holes, these wheels remain true. In fact I've gotten several years of use on these wheels without ever having them trued. Great wheels. ROLF Vector Pros and new Rolf Prima Echelons. Both Rolf wheels ride and corner well and spin up quickly, but the racing zeros are in a league a head of the the other wheels. They are really strong wheels also as I found out when I cut a corner to tight and hit a huge pot hole and was surprised that I did not break the wheel or get a pinch flat. I do not do lots of climbing but what I do has been somewhat easier as the wheels seem to spin so easy. I got these on sale and at the sale price I think they are a great value. I am sure there maybe better wheels out there, but if you you do not want to spend 2000.00 plus on a set of wheels that will make you faster try these, I think you might like them I know I do.